People say: “All roads lead to Rome”, but there are some that can take you to a sunnier place: Xcaret. Enjoy one of the best eco archaeological parks in the world, arrive there without complications and experience it during your beach vacations! Did you know that Xcaret is open all year round from 8:30 am to 10:30 pm? So, no matter the season, you can visit it whenever you want! From the name, you can see that this is an excellent option. 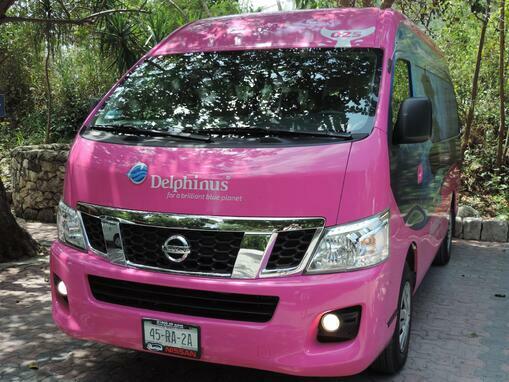 Who wouldn’t like free transportation from their hotel to Xcaret? This benefit is part of an all-inclusive package to Xcaret and it also includes access to the park and a swim with dolphins. If you want to know more about this all-inclusive package to Xcaret, and the hotels included, click here! If you rent a car in Cancun, you will only need a GPS, Google Maps or Waze to take the right route. This is a good choice if you would like to be more independent or fancy a road trip with your friends. Besides, parking is free at Xcaret, so you won’t have to pay for that. The cost of the cab from Cancun to Xcaret is around $1,400 Mexican pesos. HOWEVER, this price is for a one-way trip only, so it’s probably more convenient to rent a car or consider other options. There are two options for traveling from Cancun to Xcaret by bus: Autobuses Mayab and Transporte Playa Express. Autobuses Mayab are part of ADO transportation chain, so you can buy your tickets on their website. The cost varies from $79 to $106 Mexican pesos. We suggest you check the schedules before planning your trip. Where is the bus station in Cancun? The bus station is on Tulum Avenue (Uxmal Av. in Quintana Roo), so give yourself enough time to get there. It doesn’t matter how you travel. 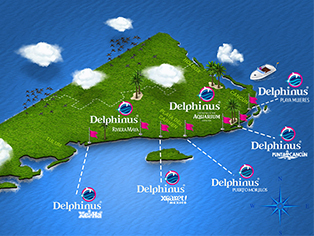 The important thing is to get to Xcaret and enjoy all the eco archaeological activities, like the swim with dolphins. You can’t miss this unique adventure!